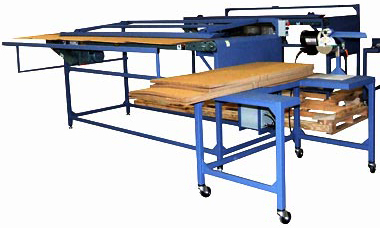 The ABC Glumaster 6100 is a semi-automatic gluer designed for maximum flexibility and ease of use. The unique, open-frame design allows an unfolded blank size up to 144” while still accommodating small die cuts, rsc’s, etc. The telescoping support bar conserves floor space. Designed for use with one operator, glue flaps are crushed and cold-set adhesive is applied in one fluid motion at the glue wheel station. This results in a flatter box and more uniform bundles. The glue station can accommodate glue flaps up to 2′ in width and has an adjustable fence to guide items through the station. Boxes are pushed against the squaring plate then inserted into the compression section. A photo eye senses the item being inserted and advances the compression section until the photo eye beam is clear. This allows glued items to be indexed and provides maximum dwell time for curing of the adhesive bond. Your Glumaster 6100 will allow you to glue inside or outside glue tabs without any changeover or additional set-up time. Size changes usually require no adjustments as well. 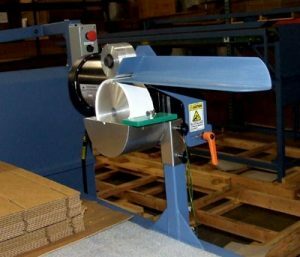 In the world of short-run, short lead time corrugated this unit provides efficient and cost-effective gluing. By turning the glue station ninety degrees, extremely long items can be glued effectively. We have done several runs of 96″ long (tall) tubes without any issues. No longer do you have to buy a 20 year old used machine to get into machine gluing this affordably. Call us to learn more about how easy this machine is to own and operate.